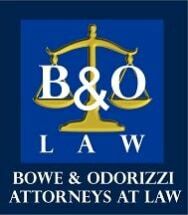 The law firm of Bowe & Odorizzi Law, LLC consists of partners Jeffrey P. Bowe and Anthony S. Odorizzi. Their offices are situated at 109 West Broad Street, Tamaqua, PA. This firm is the successor to Bowe, Lisella & Bowe. Jeff and Tony continue the work of the Bowe, Lisella & Bowe, which emphasizes estate planning, personal injury, estate administration, real estate, municipal law, and corporate law.